Rhodesian ridgebacks can be summed up in one word: dignified. They have long legs that are proportionate to their bodies, and their short coats give them a neatly groomed appearance with very little effort on the part of the pet owner. Their bodies are muscular but not overdeveloped; they are lean in appearance. Females weigh around 70 pounds, while the males top the scale at 85 pounds. Their coats are different shades of red and brown. Sometimes the face is “masked,” meaning the ears and around the eyes are darker than the rest of the coat, but not all ridgebacks have this marking. The Rhodesian ridgeback has a lifespan of 10 or more years. There are a great many inconsistencies in this breed’s history. It is a newer breed, admitted to the American Kennel Club only in 1955. It originated in South Africa, bred by the Boers in 1877. It was then brought to Rhodesia, now modern Zimbabwe. The breed standard was set in 1922 and has changed little since then. As with most hounds, Rhodesian ridgebacks were bred for hunting. Unlike their more squat compatriots in the Hound group, ridgebacks were bred for hunting in packs for big game — most commonly lions. They hunted with humans, cornering the lion, distracting him and thereby allow the human hunter to take a clean shot. However, these dogs are also extremely talented bird dogs and make excellent hunting companions for a wide variety of animals. The Rhodesian ridgeback is friendly and loyal with family, and is reserved with strangers but not aggressive. Regular walks are required daily, with a long walk every week. Ridgebacks have a very short coat and thus require little in the way of grooming. Using a soft brush once a week and baths as needed will keep this dog in good stead. This, of course, includes all the usual dog care — regular ear cleaning, teeth brushing and nail trimming are required for any breed. Ridgebacks are not without health problems. They are prone to both hip and elbow dysplasia, dermoid sinus, bloat, hyperthyroidism, cataracts and neospora canium. Most of these conditions are genetic. As with any animal, much of its health is dependent on how well its human companion maintains its health. Regular veterinarian visits and a good diet will keep your Rhodesian happy for many years. Is the Rhodesian Ridgeback the Right Dog for You? The ridgeback is a “lifestyle” dog. The right owner for this dog will be willing to invest a lot of time and energy into regular exercise as part of his or her lifestyle. This breed was made for long hunting trips in the African Savannah and thus needs a lot of exercise. To have one of these dogs in a city or suburban environment, the owner must commit to an active daily routine involving long walks and runs. This dog is protective but not aggressive and works well for families as long as the animal’s exercise needs can be met. 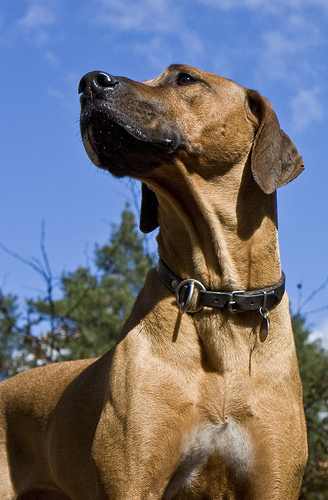 The AKC ranked the Rhodesian ridgeback as number 44 out of 173 in popularity for 2011. Please consult rescues and adoption resources first. Purebred Rhodesian ridgebacks can wind up in shelters too. Check out Petful’s adoptable pets search.